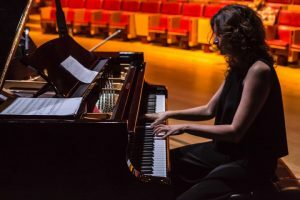 Tania Giannouli’s starting point as a pianist is classical but her music includes a keen interest in improvisation. 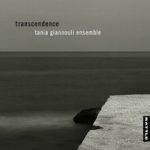 It’s no wonder that her most recent album with the Tania Giannouli Ensemble (piano, cello, reeds, drums, & percussion) is titled “Transcendence”, rising above all-too-limiting genre labels. Piano was my first instrument. I was five years old when my mother took me to the piano teacher. It was her idea, I never actually asked for it and I am not sure that I have ever seen someone playing the piano till then. Yet, she must have seen something in me, as she claims that I sang along with music on the radio before I could talk! The piano opened a magical new world in front of my eyes. I got my first piano when I was ten, and I spent endless hours with it. I‘ve started to discover punk and psychedelic rock, genres I didn’t know much about until now. Recently I have also been listening to Grieg’s Lyric Pieces, Anouar Brahem and some nice albums my label, Rattle, has sent me, including Jonathan Crayford’s fantastic jazz trio and their last album, East West Moon. I really can’t answer this question. The trigger can be anything, and often it’s not musical. It could be a picture, or a sentence from a book, or a phrase in a conversation, or just the feeling of a moment. Often I’ll just sit at the piano and start playing. As I said above, inspiration comes from several sources. I need to be both “closed” (concentrating on my inner voice, an internal dialogue with myself) and “open”, to receive triggers. But it’s not something that’s always consciously controlled. They need to have the same commitment as I do. They need to be serious and professional but most importantly they need to have the same passion and enthusiasm as me. I am lucky that all of the musicians in my band share the same “fire” and bring their souls to the music. I’m grateful for that. I am not against streaming, it is the future anyway, but I’m certainly against the fact that, as things are now, artists are paid peanuts for their work. Making music is a proper and demanding profession, not a hobby. It concerns me as a musical artist that composers and performers find it harder now to earn a living. I think there have to be fundamental changes to the way that music makers receive compensation from streaming services. Otherwise the production of good music will adversely affected. Your favorite bands may not be able to afford to make albums soon. It’s important to consider why the music industry has come to this point, and what the future hold for music makers. 7. You’ve played in a volcano, if money and time were no object, what would your next project be? The volcano, yes – that was something, a great experience. At the moment I’m involved in two projects: a new album with TGE, and a special and very intimate duo. This is where my attention is focused right now. Even if money and time were no object, I wouldn’t do anything different to what I’m doing at the moment. 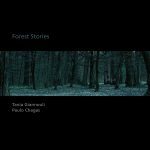 It is time for some new and beautiful music.